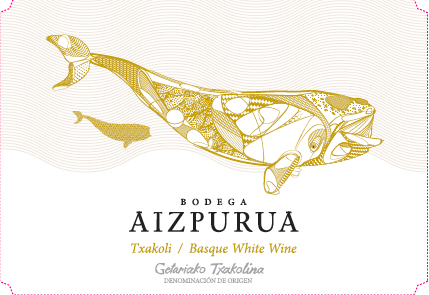 Bodegas Aizpurua is a small, family-owned and operated winery in the Txakoli de Getaria DO of Spain. Situated in the verdant and high mountain slopes of Meagas along the famous El Camino de Santiago, only up the slopes from the north coast of Spain, the family has been growing grapes and making their wines for several generations (since 1834). Just 14 hectares of sustainably-farmed vines (ranging from 7 years, to well over 50 years old) that are overhead trained to encourage air to flow under the grape clusters, produce the estate's 120,000 bottles annually, maintaining the traditional practices of the surrounding wine region to obtain their classic Txakoli. Aizpurua Txakoli comes from the oldest and furthest north Txakoli zone, Getariako Txakolina (Txakoli de Getaria). Coming from the estate’s sustainably farmed (not certified) Hondarrabi Zuri vines, this classically styled Txakoli was fermented at very low temperatures using only naturally occurring yeasts. With only time in stainless steel, this wine was bottled in the traditional tall green bottle with the incredibly fresh and zippy acidity that is complemented by as slight effervescence that is common in this Basque region white wine. Clean and approachable with ample tart fruit and an exciting mouth-feel, this wine has a quality of the briny sea and is perfect with many types of fresh shellfish, however can also pair beautifully with, and cut right through rich and hearty meats. Aizpurua Txakoli Rosado comes from the oldest and furthest north Txakoli zone, Getariako Txakolina (Txakoli de Getaria). The estate has always farmed both Hondarrabi Zuri (white) and Hondarrabi Beltza (red) on their property, but have always chosen to sell off the red fruit as the desire for red wine and rosé in Txakoli country has been nominal. This 2018 vintage is the first ever Rosado produced at the estate, coming from a blend of 80% white grapes and 20% red. The grapes were fermented separately and then blended immediately to make a gorgeous light pink color, and a fresh, zippy, well-fruited rosé. High acid is still at the core of this Txakoli, along with perfect salinity from the nearby ocean, citrus, and a touch of red berry fruit. Pour from high above the glass, and consume immediately with shellfish or hard cheeses.